The battle of Okehazama (桶狭間の戦い) is the battle happened in 1560 between Oda Nobunaga and Imagawa Yoshimoto. 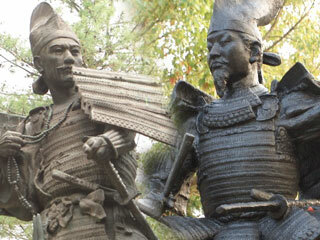 It is one of the most exciting victory because Nobunaga with only 2,000 armies won against 25,000 armies of Yoshimoto. The battle of Okehazama is the major turning point of the history of Japan. After this battle, Nobunaga started the great revolution which changed Japan, and Imagawa clan was fallen immediately after this lost. Most of the related spot of Okehazama has no parking. In early 16th century, when Daimyo of Mikawa had died and lost its control, Owari Oda clan and Suruga Imagawa clan started having struggled with the supremacy of Mikawa. In 1548, Imagawa won the battle of Azukizaka against Oda Nobuhide and Nobuhide lost the control of Mikawa. When Nobuhide died and his son Nobunaga succeeded Oda clan, the castle lords of Narumi Castle, Odaka Castle and Kutsukake Castle were betrayed Nobunaga and turn into Imagawa Yoshimoto. However, Nobunaga put back his land and prepared strong army within few years, and built several fortresses to surround those castle to isolate from Yoshimoto. In May 12, Yoshimoto raised his 25,000 armies to help those castles and to give Nobunaga serious damage. He was trying to hold supremacy of not only Mikawa but also Owari with this war. ... is the castle of Oda clan and Nobunaga at that time. At this moment, 4,000 armies were the most Nobunaga can prepared. He and his samurai had strategy meeting to decide what they are going to do, but Nobunaga never said anything and simple stayed in quiet. In June 11, Tokugawa Ieyasu, Matsudaira Motoyasu at this time, was ordered to bring food to Odaka Castle and attack Nobunaga’s fortress. Also, Yoshimoto gave a major part of his armies to Katsurayama Families and ordered to attack Kiyosu Castle. he danced “Atsumori.” And left the castle with few great samurai. He was waiting for this moment. Only his chance to win against such a huge number of armies with only 2000, is that he had to wait until Yoshimoto divided his armies and empty himself with few armies. After he finish dancing, he left the castle at 4am. He arrived at Atsuta Shrine 8 o’clock in the morning, and prayed for his victory. At 10 am, Nobunaga arrived Fort Zenshoji, which was surrounding Narumi Castle, and prepared 2,000 armies. At the same time, Fort Maruo, which was surrounding Odaka Castle was defeated by Ieyasu, and other Fort Washizu was also defeated. The area around Odaka Castle was completely ordered by Yoshimoto. Yoshimoto settled his headquarter at Kutsukake Castle which is located far east of Owari. At the noon, he was informed that most of Nobunaga ’s fortresses were defeated. When he heard that news, he moved himself to Odaka Castle. At this moment Imagawa had only 5000 of army by him. Around 1pm, suddenly there was heavy rain which blind both Nobunaga and Yoshimoto and shut down the all information about each others. However, Nobunaga found where Yoshimoto was located. At 2pm, when it stoped raining Nobunaga succeeded to give Yoshimoto surprise attack. Yoshimoto ’s army was just left from Kutsukake castle and not prepared to start battle. So, Nobunaga had 2,000 armies which were completely well prepared for the battle and Yoshimoto had 5,000 armies which were not prepared for the battle at all. It became hard face-to-face combats and even Nobunaga got off his hours and fought with his spear. Finally, Yoshimoto was killed by Mori Shinsuke. Just like killing King in Chess, when the head of the armies was kill, no matter how many armies Imagawa side had, they can do nothing without a chain of command. All the armies of Imagawa retreated from Mikawa and back to Suruga. After this battle Nobunaga finally got over from hard situation and he started moving forward to his success story which involved all Daimyo at this time. Imagawa clan got confused so much, and during their confusion, Tokugawa Ieyasu breached the alliance between Imagawa, and made new strong alliance with Nobunaga. This alliance becomes the Union of Oda and Tokugawa which took over Japan within next half century. The battle of Okehazama is considered as the turning point of the history of Japan. Nobunaga was lucky, but when you see it from now. It was meant to be. It was almost like a destiny.